Several months ago, we were having a skunk problem around our house. They would only come out at night, and at any given time, you could see at least two! I don’t know about you, but I HATE skunks! I had rather encounter a mountain lion or a bobcat than a skunk. Did I mention I hated skunks. They smell HORRIBLE! They can just walk by and the stinch is, well, you understand. For me, any nocturnal creature can be vulpine. I guess it is because they move under the cover of darkness. These smelly rodents were also after my laying hens. Why did God create these?? After successfully having a couple of hens for a midnight snack, I waged war on these nasty scoundrels. I pulled out the artillery and sent a couple skunks to be with Jesus (not really). The stinch around my house was almost unbearable and my family was ready to murder me. However, if I had not have done anything, these “lovely” creatures would have pro-created and taken over our land. I was willing to smell the nastiness for a few days, than to risk getting sprayed by one. Or our cars sprayed. Or losing more chickens. Or having a skunk farm against our wishes! Can I get a witness? Can our walk with God be like dealing with the nasty creatures? We all have nasty things in our lives that, at sometime or another, HAS to be dealt with! Sadly, we postpone them because it may stink horribly initially! 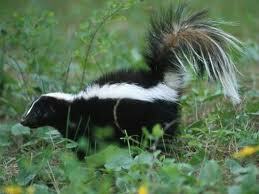 Then, before we know it, we have a “skunk” problem in our own life. The problem is bigger, more numerable, and is definitely going to be harder to deal with. If we could go back in time, we would surely have suffered the pain in the beginning than postponing it. Here are some skunks that can over-take our lives and cause TONS of pain and hurt if not properly dealt with. This entry was posted in Discipleship, Life, Sin. Bookmark the permalink. 2 Responses to What Is That Smell? Our neighbors had a skunk come into their house through their central air unit. It crawled into their bedroom in the middle of the night. It took them 3 hours to lure it out with food, but it never sprayed. By the time the husband got it on the porch, he said it was going in and out around his feet like a house cat. A lot of us treat our sins this way. Instead of waging war against it, we treat it like our pet and it never wants to leave. Enjoyed this post and now I know who to call when we need a skunk exterminator. I am no exterminator by any means! I totally agree with treating our sins like a pet! !